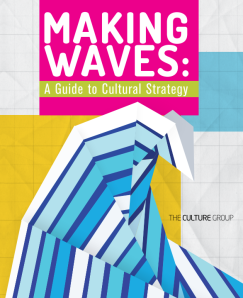 This post is a review of the report Making Waves: A Guide to Cultural Strategy, from the Culture Group. Fresh off the presses in 2014, we’ve got a new guide for organizers and activists interested in developing cultural strategies for social change. This one comes to us from The Culture Group, a collaborative of artists and social change experts committed to the idea that “there is no change without cultural change.” It’s a highly visual and readable look at the power of art and culture, and how to begin building partnerships between artists and organizers. Making Waves uses the metaphor of an ocean wave to describe cultural change. Culture, they explain, is like the ocean: vast and ever-changing. It is all around us. Cultural strategy is about making waves in that ocean through the use of cultural practices and activities like art, media, sports, etc. — what they refer to as the “big tent of arts and culture.” Given how many definitions of culture are floating out there, this is a useful metaphor for re-imagining social change efforts, and one of the most accessible explanations of culture and social change that I have seen. For the most part, this report is targeting organizers who may be skeptical of the importance of art and culture in social change, or who don’t know how to go about addressing culture. The #1 strategy they offer: Partner with artists. In a section titled “Why Artists?” the authors offer a compelling, if somewhat romanticized, view of the particular strengths of artistic voice. This includes artists’ ability to connect with people emotionally, to be bold and visionary, and to address fundamental social issues. This definition is intriguing to me because of its heavy emphasis on organized artists, which calls to mind historical organizations such as the American Artists’ Congress. This report also introduced me to the idea of a “cultural producer”: a cultural strategist who can speak the “languages” of both art and organizing, and can help develop partnerships between the two worlds. Overall, Making Waves is stronger on making a case for cultural strategy than for guiding how it can be done. There are some great case studies, but I personally didn’t need 20 out of 50 pages dedicated to proving that cultural events have often outshone and even preceded political events. And the sections on strategy and tactics are useful, but aren’t particularly tailored to cultural strategy. Tips about setting goals, defining an audience, and outlining how decisions will be made are relevant to any sort of organizing campaign. I believe the reason that the “how-to” section seems very general is that the authors don’t want the organizers to have their hands in the art too much — organizers are told to make room for the artists to lead. This is a very important lesson for organizers who in general have under-utilized cultural approaches, seeing artists as adding “decoration” rather than substance to campaigns. But it seems to assume the artists more or less know what they are doing in terms of using art to support social change. For most artists, this is likely not the case. Perhaps a good companion to this report would be the book Re:Imagining Change, by the Center for Story-Based Strategy whose theories on narrative could be very useful to both artists and organizers. I love how this document seeks to re-imagine the role of artists in organizing. At the same time, I’m not sure how I feel about the advice that organizers “don’t try this at home…creating an effective, powerful work of art is not easy…be willing to invest in real talent.” It is true that well-meaning but untrained activists have made some pretty bad art. But, to me, this argument makes too strong a distinction between “artists” and “non-artists,” and focuses a bit heavily on the arts that involve individual training, as opposed to more grassroots arts practices which have been so important to social movements in the past — African American spirituals, Native drumming practices, etc. I would recommend this as a good starting point for any organizer looking to move beyond short-term policy wins to long-term change. If you are an artist working with social justice organizations, you may want to pass this along. And while you’re at it, check out the other great resources from the Culture Group.